Home Date Interview Questions Medium Date Questions How to find day before N years in Java? Write a program in Java that finds a day before N years. For example - on 25th Jan 2017 day is Wednesday and 7 years ago on same date 25th Jan 2010 day was Monday. The solution of this problem is very simple. With the help of Calendar class constant YEAR and DAY_OF_WEEK we can easily solve this problem. * @problem Day before N years? // Subtracting years from Calendar. Output - How to find a day before N years in Java? 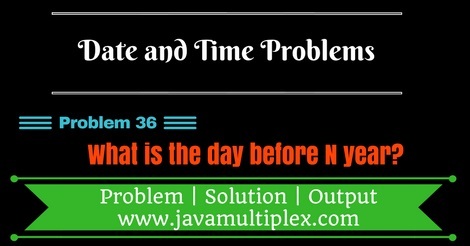 Tags : Date and Time problems, Day before n years, Solution in Java, DateFormat, SimpleDateFormat, String, Calendar, switch statement.